For September, I chose the wonderful Cráneo Organic Mezcal to share with friends so we could experience Master Distiller David Ravandi’s superb creation. You may be familiar with David Ravandi. His Tequila, Tequila 1,2,3 has received many awards and accolades from aficionados. He’s an expert at knowing exactly when the Agave should be picked so the terroir shines through and it’s at the height of natural sweetness. The perfection he brings to Tequila 1,2,3 is one of the reasons I decided to try Cráneo – I was naturally curious to see what he would produce in a Mezcal. Cráneo is Spanish for skull. 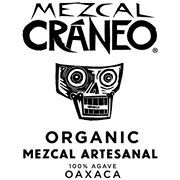 The label brings to mind ancient civilizations where the Agave was revered for its medicinal properties. It depicts a stylized skull inspired by the Aztec goddess Mictecacihuatl, which symbolizes strength. From this skull grows a life-affirming Agave plant. The bottle is made from hand-blown recycled clear glass, allowing you an unobstructed view of the contents. Using recycled materials is common in artisan Mezcal distilleries – there is a reverence for the Earth and desire to preserve culture and resources that is present from village to distributors. When you try this Mezcal, take a moment to admire the meticulous artwork of the label and the clarity of the spirit. Cráneo is made from single village, 100% Espadín Agave. Santiago Matatlán is 5,600 feet above sea level in Oaxaca, with cool nights and hot days – perfect weather for the Espadín, which still grows wild on the rocky hillsides. David Ravandi was the first to treat Tequila as a premium spirit as far back as the early 1990’s, aging it in French Oak barrels. His intention here is clear – Mezcal is a national treasure to be preserved and presented in a way that does justice to the meticulous methods of distillation. He feels strongly that the old, time-honored methods of creating fine Mezcales are what produce the best product – and is very much against mass production and quick methods. The Agave is harvested only when fully ripe, roasted in a charred pit oven and crushed by an enormous stone tahona. When natural fermentation takes place, small batches are distilled twice in copper pot stills. I love this clear, crisp Mezcal! In each sip I can taste the history of Santiago Matatlán, the reverence of the land and the respect of the Earth. The aroma is of fresh Agave, pure and clean. Light, juicy and bright on the initial taste, followed by fresh fruit and a hint of charred smoke. Silky on the tongue, it warms with each sip adding a subtle flavor of sweet citrus. It has a long, enjoyable finish. While sipping this Mezcal by itself is a wonderful experience, we loved it even more when paired with the Coctel de Camarón and Cosecha Fish Tacos.